"The Poshbrains middle management course provided invaluable training. It enhanced my skills as a manager, allowing time for reflection and so movement forward. A central part of this process was in having the opportunity to share ideas. In this exchange a close support network developed that I could then tap into. From attending this course my skills and confidence as a manager have significantly developed and I will take this learning with me throughout my career." National College of School Leadership 2010. 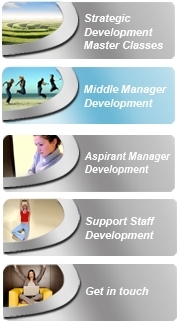 The Poshbrains programme for middle managers has provided bespoke development for over 200 participants since 2003. The programme is endorsed by the Institute of Leadership and Management. The core purpose of the programme is to provide a professional learning community to develop the leadership effectiveness of middle managers / leaders to enable them to contribute to the school’s strategic direction. To engage them actively in a process of self managed personal learning and development. To increase their ability to manage innovation and change in the context of their own school. To enhance their self-confidence and competence as managers/team leaders. To construct a foundation of skills, knowledge and understanding of management / leadership behaviours in order to increase their repertoire of responses to a broad range of scenarios. To encourage them to build capacity in their own area through the efficient and effective management of people and resources. The course is delivered on site, with dates and times to suit your school. This model works exceptionally well if delivered with partner schools within local clusters.